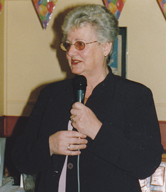 The Ballydonoghue Parish Magazine was the brainchild of Sarah Buckley, Knockenagh. Back in 1985, Sarah, with the help of Martin Lynch, produced the very first edition, thus sowing the seed for what has become a very comprehensive account of the history as well as the current happenings in a rural parish. Sarah remained with the Magazine for three years until a new Committee took on the task of continuing the work of making the annual publication a much sought after Magazine by parishioners at home and abroad, at Christmas each year. There are some of the original committee still doing trojan work which was evident in the Silver Edition last Christmas. The photos, both old and new, are very popular with the readers, the committee would encourage you to keep the Magazine in mind when attending functions, sporting events etc. as they are part of the history of the area and it is important that they are documented every year. The Annual reporting of the work of the local Committees, eg. G.A.A., Community Alert etc. are very popular with the readers. The Photographic and Creative Writing Competitions are of great interest, to both young and old, with several different categories. The Young Achiever’s Award has always created a lot of interest in the parish, which has honoured many young people in their chosen careers. You can now order your copy of the Ballydonoghue Parish Magazine here. The county library has a number of back issues available for people to view here.